One thing among many which unites India is Pollution. Any city you go all over India you will find dust blowing with wind, lot of pollution due to traffic. In summers sweating add to existing problem as dust sticks to skin and made us look like ghost. Thank God to Emami who have understood need of Indian consumers and have launched Boroplus Anti Pollution Face Wash. Today I am going to review it on reviewandwriteup. About the Product – The product is launched under renowned brand, Boroplus of Emami Family. Boroplus is the best antiseptic cream in India. I am glad that they have a face wash too now. Ingredients – Key ingredients are grapes and green tea. However the face wash doesn’t enlists long list of ingredients. These are the only two mentioned on the pack. Packaging – Superb packaging. 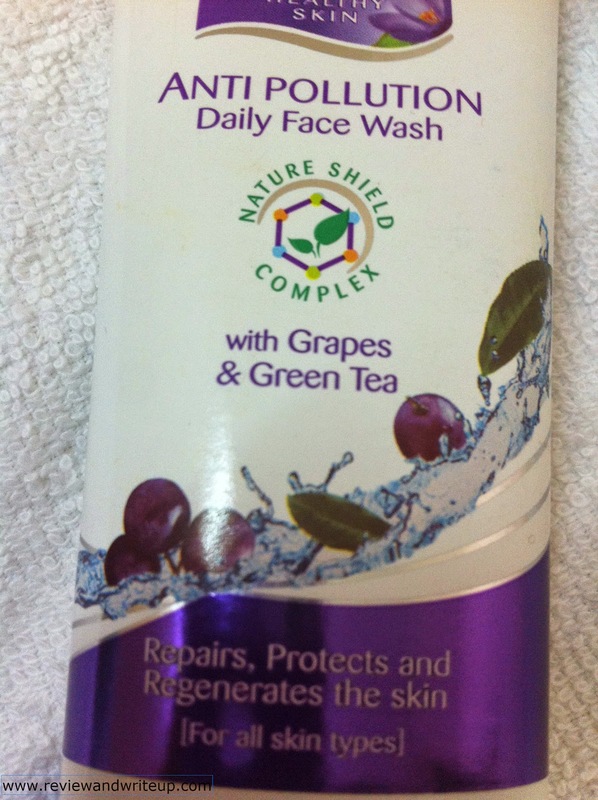 Face wash comes in a sturdy, sleek plastic tube with purple color flip open cap. They have used white-purple combination for tube. Purple used on tube is shining one. It will remind you easily of Boroplus cream but still it has its own unique features. I like how big font has been used to mention about the product all over the tube. Tube could easily be kept vertically on table, washbasin. 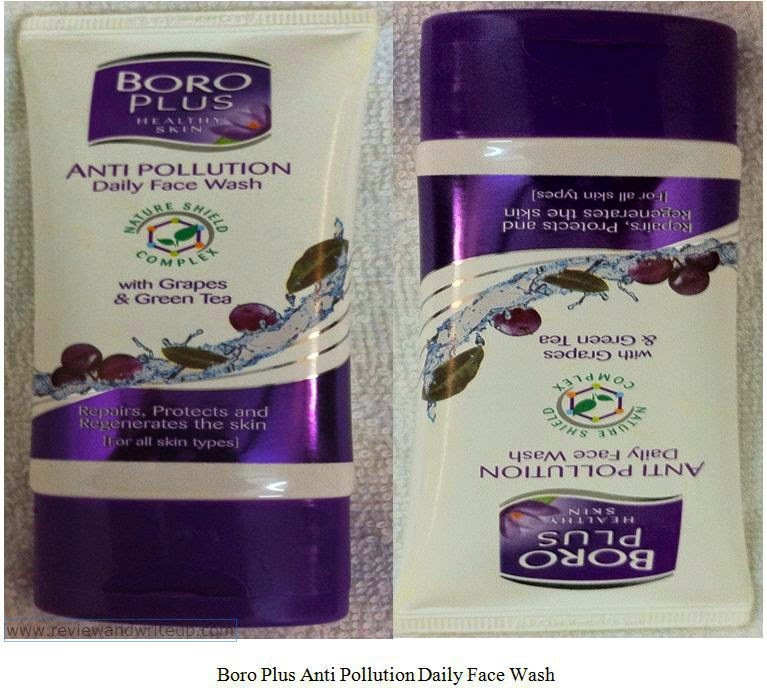 Claims of the brand – Brand claims that Boroplus Anti Pollution face wash has an innovative nature shield complex developed by Ayurvedic and International skin experts that has been clinically tested. The Face Wash restores and maintains skin’s moisture balance, deeply cleanses the skin to remove pollutants, repair skin damage. My experience – I have oily skin and due to which I end up washing my face at least three times a day or sometimes even more. I am using Boroplus face wash from last one week. I used to wash my face with Boroplus Face Wash after coming back home from work. I would wash my face with plain water, and then I will squeeze out Face Wash on my palm, just a little is enough. Face Wash is milky white in color. I will then gently massage it all over my face and will wash it away. Face Wash lathers up so easily, feels light on my face and is washed away in two splashes of water. It leaves my skin feeling soft, refreshing. You can immediately feel the difference in your skin. I don’t feel need to moisturize my skin immediately after wash. The smell of face wash is so good that you want to keep smelling it. Fragrance stays for good 15-20 minutes on your face and hands. Face Wash is easy to carry in bag as it won’t spill for sure. It comes in affordable price and is easily available. This face wash is recommended by Dermatologists as well. I have full trust on brand Emami that they must have used natural ingredients to create this Face Wash. I am fully satisfied with the product. R&W Recommendation – Thumbs up to the face wash. It deeply cleanses the skin and you would love its smell as well. I would suggest you to keep one in your bag as well especially during summers.